*The Lebanese government does not differentiate between civilians and combatants in death toll figures. vs. the ethnic composition at the North of Israel (pink). ↑ Matthews, Matt M. We Were Caught Unprepared: The 2006 Hezbollah-Israeli War, DIANE Publishing, 2011. ↑ "Both Hezbollah and Israeli Leaders Declare Victory". http://www.foxnews.com/story/2006/08/14/both-hezbollah-and-israeli-leaders-declare-victory.html. Retrieved on 13 October 2015. ↑ "Israeli Gains in the Second Lebanon War". https://www.jewishvirtuallibrary.org/jsource/talking/50_hizwar.html. Retrieved on 13 October 2015. ↑ "Rebuilding and Security in Focus". Wall Street Journal. 11 September 2006. https://www.wsj.com/public/article/SB115306760246608000-fL7werP3z8be6sp5glfKY2bil9I_20070721.html?mod=tff_main_tff_top. Retrieved on 20 September 2014. ↑ Herbert Docena (17 August 2006). "Amid the bombs, unity is forged". Asia Times. http://www.atimes.com/atimes/Middle_East/HH17Ak02.html. Retrieved on 25 نومبر 2011. "The LCP ... has itself been very close to Hezbollah and fought alongside it in the frontlines in the south. According to Hadadeh, at least 12 LCP members and supporters died in the fighting." ↑ "PFLP claims losses in IDF strike on Lebanon base". The Jerusalem Post. Associated Press. 6 August 2006. https://web.archive.org/web/20120203070450/http://fr.jpost.com/servlet/Satellite?cid=1154525814854&pagename=JPost%2FJPArticle%2FShowFull. ↑ "Some 30,000 Israeli troops in Lebanon – army radio". Yahoo! News. Reuters. 13 August 2006. https://web.archive.org/web/20080215135534/http://asia.news.yahoo.com/060813/3/2of6v.html. ↑ Nicholas Blanford (11 August 2006). "Hizbullah's resilience built on years of homework". The Christian Science Monitor. http://www.csmonitor.com/2006/0811/p01s01-wome.html. Retrieved on 23 جنوری 2012. ↑ "State snubbed war victim, family says". ynetnews.com. 30 August 2007. https://web.archive.org/web/20080602073716/http://www.ynetnews.com/articles/0%2C7340%2CL-3443979%2C00.html. Retrieved on 13 July 2008. ↑ BBC News Online (8 March 2007). "PM 'says Israel pre-planned war'". Retrieved 9 March 2007. ↑ "The Final Winograd Commission report, pp. 598–610" (in Hebrew). http://ico.walla.co.il/w6/v/special/vinograd.pdf. Retrieved on 23 ستمبر 2013. ↑ Con Coughlin (4 August 2006). "Teheran fund pays war compensation to Hizbollah families". The Daily Telegraph (London). https://web.archive.org/web/20070530003725/http://www.telegraph.co.uk/news/main.jhtml?xml=%2Fnews%2F2006%2F08%2F04%2Fwmid404.xml. Retrieved on 2 مارچ 2007. ↑ Patrick Bishop (22 August 2006). "Peacekeeping force won't disarm Hizbollah". The Daily Telegraph (London). https://web.archive.org/web/20080305095215/http://www.telegraph.co.uk/news/main.jhtml?xml=%2Fnews%2F2006%2F08%2F22%2Fwmid122.xml. Retrieved on 30 اپریل 2007. ""A UN official estimated the deaths at 500""
↑ 24.0 24.1 "Lebanon Sees More Than 1,000 War Deaths". usti.net. Associated Press. https://web.archive.org/web/20120206055402/http://news.usti.net/home/news/cn/?%2Fworld.mideast.misc%2F1%2Fwed%2Fbq%2FAlebanon-war-deaths.RYBR_GDS.html. ""Israel initially said 800 Hezbollah fighters died but later lowered that estimate to 600."" ↑ Yossi Melman (19 May 2008). "Israel to Hezbollah: Forget Palestinian prisoners in swap for IDF soldiers". http://www.haaretz.com/print-edition/news/israel-to-hezbollah-forget-palestinian-prisoners-in-swap-for-idf-soldiers-1.246116. Retrieved on 20 اکتوبر 2011. ↑ "Lebanon – Amnesty International Report 2007". Human Rights in LEBANESE REPUBLIC. Amnesty International. https://web.archive.org/web/20150217122530/https://www.amnesty.org/en/region/lebanon/report-2007. ↑ (2010) Moral Dilemmas of Modern War: Torture, Assassination, and Blackmail in an Age of Asymmetric Conflict. Cambridge University Press. ISBN 9780521866156. Retrieved on 20 September 2014. 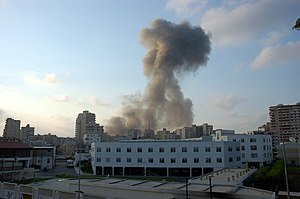 ↑ Israel/Lebanon: Out of all proportion – civilians bear the brunt of the war, Amnesty International, November 2006. ↑ "Implementation of General Assembly Resolution 60/251 of March 2006 entitled "Human Rights Council"". United Nations Human Rights Council. 23 November 2006. https://web.archive.org/web/20130617180405/http://www2.ohchr.org/english/bodies/hrcouncil/docs/specialsession/A.HRC.3.2.pdf. ↑ (2010-02-01) CANADIAN YEARBOOK OF INTERNATIONAL LAW: 2008. ISBN 9780774859172. Retrieved on 20 September 2014. ↑ SIPRI Yearbook 2007: Armaments, Disarmament, And International Security, Oxford University Press, page 69. ↑ (2006) Yearbook of International Humanitarian Law:Volume 9; Volume 2006. ISBN 9789067042697. Retrieved on 20 September 2014. ↑ "United Nations Interim Force in Lebanon (UNIFIL)". United Nations. 6 August 2009. https://web.archive.org/web/20101210081548/http://www.un.org/en/peacekeeping/missions/unifil/index.shtml. Retrieved on 16 January 2011. Cordesman, Anthony H. (2007). 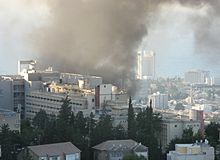 Lessons of the 2006 Israeli–Hezbollah War. Washington: CSIS. (2008) 34 Days: Israel, Hezbollah, and the War in Lebanon. New York: Palgrave Macmillan. Kober, Avi (2008). "The Israel Defense Forces in the Second Lebanon War: Why the Poor Performance?". The Journal of Strategic Studies 31 (1): 3–40. Matthews, Matt M. (2006). We Were Caught Unprepared: The 2006 Hezbollah-Israeli War. The Long War Series Occasional Paper 26, U.S. Army Combined Arms Center Combat Studies Institute Press Fort Leavenworth, Kansas. "The final Winograd Commission report (Hebrew)". https://web.archive.org/web/20120830094827/http://go.ynet.co.il/pic/news/vinograd/vinograd.pdf. Retrieved on 4 December 2011.